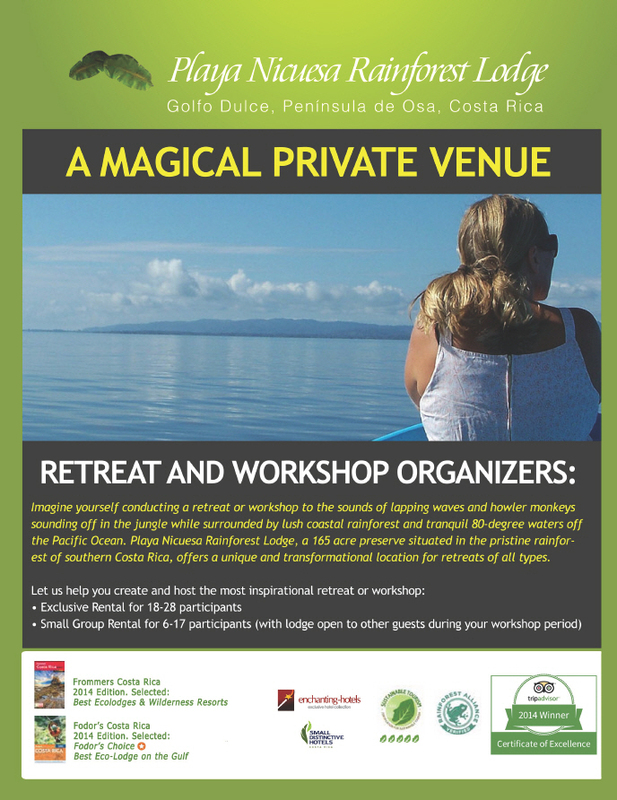 Picture yourself participating in a retreat or workshop with the sounds of lapping waves and howler monkeys in the jungle while surrounded by lush coastal rainforest and tranquil 80-degree waters off the Pacific Ocean. CHECK OUT OUR agenda of UPCOMING RETREATS & EVENTS! Playa Nicuesa Rainforest Lodge is available as a vacation rental to groups of up to 28 who desire a natural reprieve, unlimited activities, beautiful accommodations, and unparalleled service in a pristine environment. Programs can be tailored for friends, families, sports clubs, environmental organizations, classes and educational retreats. In addition to unlimited self-guided use of preserve trails, paddle boards, kayaks, fishing and snorkeling gear.... Your group will enjoy 1 guided kayak/snorkeling/paddle board and rainforest hiking/birding tour daily. You may also arrange massage, yoga and additional tours at regular prices to be paid upon checkout. We offer 5 private cabins (three 1-bedroom, one 2-bedroom and one cabin suite) and the separate 4-room Mango Guest House and 2-story, 3-bedroom Jaguar House. All rooms feature private entrances, hot water open-air showers, hardwood floors, ceiling fans, and private wrap around terraces. We offer complimentary private boat pick-up and drop-off between lodge and the towns of your arrival/departure, either Golfito or Puerto Jimenez. Enjoy fresh, local food each day prepared by our chefs and served in our restaurant with canopy view. Our cuisine focuses on local tropical fruits and vegetables grown right here and freshly caught fish. Vegan and vegetarian menus are also available. Our on-site staff of 20 will ensure your group will enjoy an amazing tropical retreat. Managers, Chefs, Certified Naturalist Guides, Massage Therapist, Yoga Instructor, Boat Captains, Housekeeping. Enjoy complimentary use of preserve trails, paddle boards, kayaks, yoga equipment and fishing and snorkeling gear.